The Eco-Music Big Band is proud to present its debut performance at Carnegie Hall on June 3, 2017 at Zankel Hall. This program entitled Speaking Truth to Power, showcases what the Eco-Music Big Band does best: virtuosity in both improvised and notated music, cross-genre styles, and dynamic musical and theatrical experiences. This program features a jazz reimagining of Igor Stravinsky’s L’Histoire du Soldat, featuring celebrity actor and librettist-in-residence John Palladino (Orange Is The New Black); the posthumous premiere of Fred Ho’s virtuosic baritone saxophone concerto, When The Real Dragons Fly!, featuring the leading expert on Fred Ho’s baritone saxophone style, Larry Bustamante; David Taylor’s iconic reimagining of Franz Schubert Der Doppelganger; 8 Songs for a Drag Queen, a drag mini-opera featuring countertenor and trombonist David Whitwell, with libretto by John Palladino and music by Italian composer Girolamo Deraco and librettist John Palladino; and a preview of the jazz opera Angela’s Ring, by GRAMMY-Award winning producer and librettist Kabir Sehgal and composer Marie Incontrera. World Entertainment Company, the European artist’s agency, has in part made this performance possible. This dynamic and unprecedented evening brings jazz and classical music together, fusing the traditions of the highest art music and the improvisation heard in jazz clubs, and showcasing the cross-genre virtuosity of our musicians in both notated and improvised styles. The Eco-Music Big Band is a multigenerational and professional “virtuoso band” (The NYC Jazz Record) that defies style, tradition, and expectations with genre bending, avant-garde performances and recordings. NPR/WNYC’s John Schaefer has said of the band: This hard charging outfit, led by Marie Incontrera, has more on its mind than just swing music.” Founded by Fred Ho in 2013, the Eco-Music Big Band includes some of the nation’s most acclaimed cross-genre virtuoso musicians, including David Taylor, Nolan Tsang, Michael Feinberg, Felix Del Tredici, and David Whitwell. 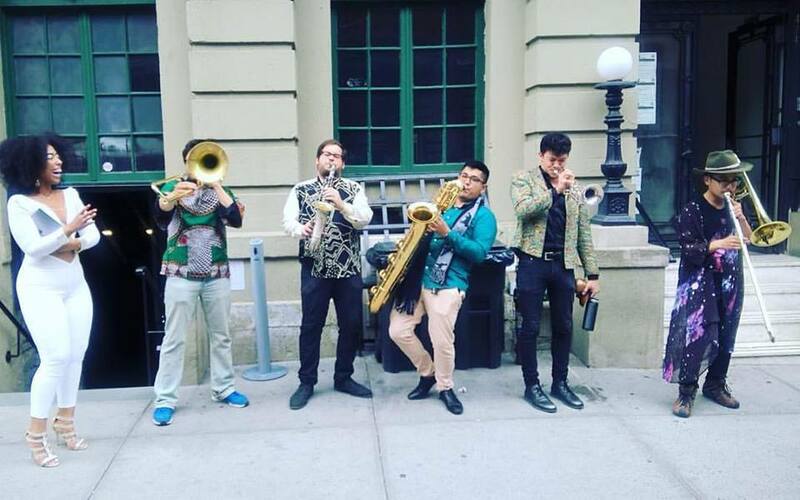 A collective virtuoso of musicians with projects that vary in size, the Eco-Music Big Band is a forerunner in under-represented and cross-genre forms of music: jazz opera, reimagining of classical and avant-garde works, and music for the express purpose of political action and discourse. This performance has been made possible, in part, by World Entertainment Company – Mary Sharp Cronson & The Evelyn Sharp Foundation, MAC Makeup, and Theodore & Margery Mayer.